NewsHome » News » News » Twenty years to close a sale. Being (Ultra) Cool! 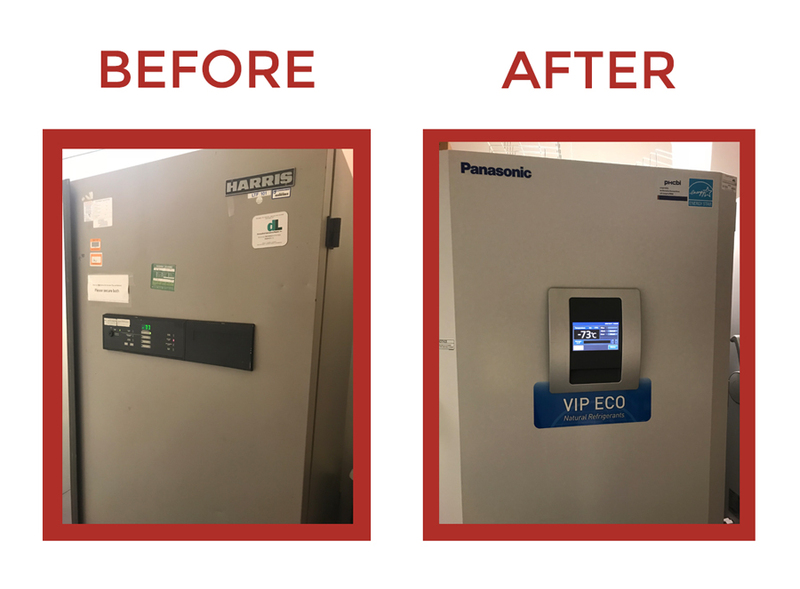 Over the summer, we replaced FinaBio’s ancient ultracold freezers with two new Panasonic freezers from PHC. John Bergen, now the regional manager for PHC, has been trying to sell to me for twenty years. His persistence paid off when I ran into him at the local BioBuzz beer event, just when I was thinking about freezers. Like many small biotech companies, Fina Biosolutions began with lots of used scientific equipment, which are more prone to breakdown. Most equipment failures are financially painful and can slow down work but are not catastrophic. On the other hand, a freezer failure can be a disaster with years of vital work being ruined. Even a temporary failure can mean uncertainty about the status of cell stocks, enzymes, etc. We also considered that our old freezers put out a tremendous amount of heat and that the HVAC system could not keep up, especially in the summer, putting further strain on the freezer compressors. Here are some other interesting facts I learned1,2. Our freezers (>15 yrs old) each used as much electricity as a family of four. Aging freezers consume an additional 1kWh/day per year of use. Another interesting fact is that setting freezers to -70°C instead of -80°C reduces energy consumption by an average of 37%. A service engineer told me that the lower temperature came into use as freezers became capable of the colder temperatures, and that the switch was largely driven by marketing. According to the MIT study cited, there is no benefit to -80°C over -70°C. At recent NIH tent show, I learned about Stirling Ultracold freezers that use so little energy that they can be plugged into a regular 120V outlet instead of a special 220v outlet. These freezers don’t have a compressor but use a Stirling engine3,4. Stirling engines are highly efficient and notably have no moving parts to wear out. The cost was higher than a standard ultracold, but they claimed very high reliability. Also, without a large compressor, they have a larger useable volume than a standard ultracold freezer for the same footprint. Sounded good. Studies on Stirling freezers I found online seemed very favorable for energy efficiency5, including independent studies6,7. My online search indicated that the Stirling freezers took longer to recover temperature when the door was opened than some of the conventional alternatives. So, while the Stirling freezers were better for long term storage needs, we decided that they were not a good a choice for us, as we are in and out of the freezers all day. I also learned that to achieve their reported high efficiency, some freezers need their compressors to cycle on and off much more frequently than in their standard mode. The cycling puts an added strain on the system. In the end, I settled on the Panasonic VIP Eco Ultra Low Temp freezer8based on its reputation for being energy efficient and highly reliable. It uses a “natural refrigerant” (ethane and propane) and has a steady state consumption of 7.3 kWh/day, one of the lowest for compressor ultracold freezers, according to EnergyStar. We purchased two Eco ULT freezers through the VWR BIO buyers’ program9, which gave us the best price. VWR also made sure the freezers were pre-chilled, which facilitated the transfer of material. The process went very smoothly. For a small company, this was a significant purchase but worth it. We have now had the freezers for 3 months, at a setting of -74°C, and they have been great. The area remained cool and comfortable, even during the summer. Do your research on the freezers to find one that meets your needs. Work with your technical sales reps & distributers as they are very knowledgeable and have a good sense of how equipment performs. And be ultra cool.